IN the civilised world, millions go to work every day in offices located in large urban towers and low-rise Dhaka office parks, in renovated warehouses and remodelled factories. Designs make corporate images. They inspire workers. They impress potential clients and visitors. They make businesses work better. They help shape corporate culture, and influence all who come in contact with them. Designs for the offices and studios of film, music, and other media companies tend toward the adventurous in the same way that high-tech offices do. The people who run these kinds of businesses are driven by the need to appear hip, cool, and iconoclastic. To paraphrase the television commercial, image isn't everything, but it sure plays a major role. Media and high-tech companies also share an understandable fascination with the latest in electronic and cyberspace gadgetry. The attitude is "keep it loose, even unpredictable." These kinds of businesses thrive on creative impulsive, even anarchic energy, and their environments are supposed to succour an atmosphere that lets it all hang out. And yet, it takes careful planning to make spaces that are informal without being chaotic; or funky without being lame. Don't think for a minute that this kind of design comes easy: For all their casual, cool and easy style, these spaces are intensely worked. Featured this week is a very renowned agency office in our local media industry. Their marketing director's room is our focal point. This room is cool and yet dynamic all at once. 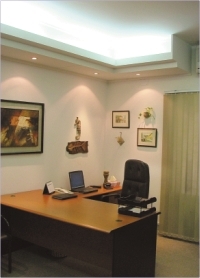 The false ceiling is white with a simple stepped design, the diffuse lights and spotlights adding that illuminative sparkle that it needs. The room's floor was covered with shabby, discoloured mosaic, so we provided a brown synthetic carpet, to add that plush look to the place. 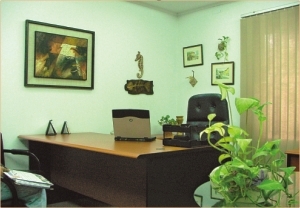 Furniture is the key element of an office room. Keeping the client's tastes in mind, we arranged a brown laminated executive table and side table for the marketing director. 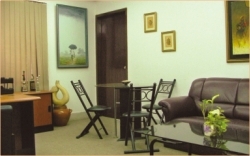 We also provided a leather sofa for guest. A small round meeting table completed the picture, a cosy but dramatic workspace. A media person is always a creative person, and our client was no different, so stocked her office with a lot of personalised stationery items, which she has a real fascination for. The final touch was provided by a display of paintings and masks on the wall. These were taken from the marketing director's personal collection. Viola! A few simple touches, and what you see is the dynamic workplace of a creative person.